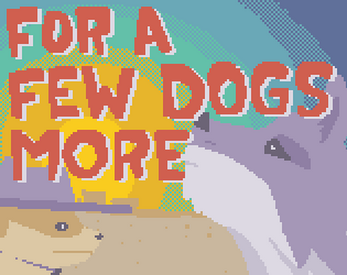 For A Few Dogs More is game I made for Buffalo Game Space's BGSjam6, which had the theme "The Wild West". It's about a cowboy prairie dog and horse wolf riding their way through four levels of critter-shooting action. The prairie dog and wolf each have a jump and shoot button, which you can combine to reach new heights and clear obstacles. The game can be played as a single-player game or two-player co-op, by either sharing a keyboard or using a keyboard and Xbox 360 controller (this version only supports one controller). I should also note that, if you're playing alone on the keyboard, comma and period do the same thing as A and S - I had time to add this alternate control scheme, but not to mention it in the game.